The photo shows Müllerian mimicry of various Ithomiinae, a day-flying moth and Heliconius numata from San Martín, Eastern Peru. This sub-ring of the tiger ithomiine mimicry ring occurs commonly between 500 and 1800 m altitude on the Eastern slopes of the Andes from Ecuador to Bolivia. Top row: Hypothyris meterus meterus, Mechanitis mazaeus ssp. Second row: Hyposcada anchiala mendax,Heliconius numata bicoloratus (Nymphalidae: Heliconiiti). Third row: Chetone sp. (Arctiidae: Pericopinae), Melinaea "marsaeus" mothone. All are Nymphalidae: Ithomiinae unless otherwise stated. See also details of other ithomiine -- H. numata mimicry rings from San Martín, Mathieu Joron's web page and the paper by Joron et al. 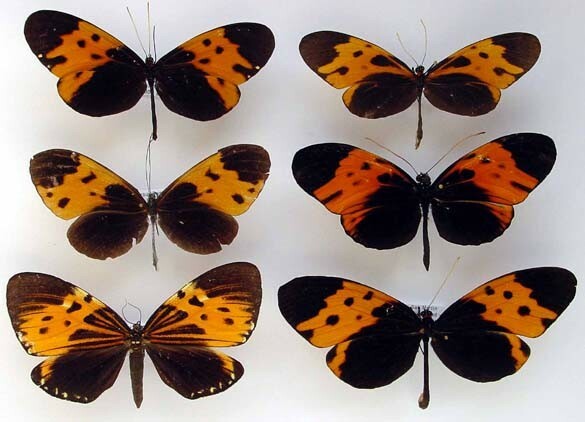 on the maintenance of mimetic polymorphism in Heliconius numata.